Home / Recipes / It’s Eastover!! I’ve got a beautiful wife and two beautiful children which makes for a gloriously happy home. Even more, I am grateful that my family is a blending of two wonderful cultures. This nice Jewish boy from New Jersey has the most amazing mother-in-law from El Salvador and she makes the BEST glazed ham I’ve ever tasted. 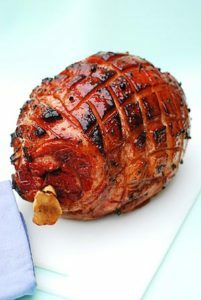 This time of year we celebrate Easter and Passover with a delicious glazed ham, courtesy of my mother-in-law, Raquel. Of course, I provide the latkes! And now for Raquel’s famous glazed ham recipe! After the ham has cooked 30 minutes, take it out of the oven and pour the pineapple, rum glaze all over the ham and pop it back in the oven for 90 more minutes. For Eastover I like to serve it with latkes and grilled asparagus with lemon. Don’t forget the sea salt and crushed red pepper flakes!!! Even if you didn’t grow up with a Jewish Grandmother, you can make latkes that will make your dinner guests kvell. With your hand grater, grate potatoes and onion. Drain as much liquid from the grated veggies as possible. Add eggs, matzo meal, salt, and pepper. Put oil into a preheated sauté pan. Take a large tablespoon of potato and onion mixture and place into the pan and repeat. Cook until golden brown on both sides and let cool on a cooling rack. This will rid the latke of any excess oil. *note If the latkes are very thick you can finish cooking them on a cookie tray at 350 degrees for about 10 minutes. If you’d like to see me turning a family-sized latke you can check it out here!